Big News for Student Research! BIG NEWS! This research will be part of larger presentations at the American Indian Workshop at the University of Leiden in the Netherlands from May 21-25, 2014. Here are the shortened descriptions. Posted in Uncategorized | Comments Off on Big News for Student Research! Amidst the round of student questions coming mid-quarter/semester, this one’s especially forceful: How do we bring strong visual content into our presentations? While I’ll cover this in class over the next few weeks, I really want to pass along this great resource: HubSpot’s “5 Infographics to Teach You How To Easily Create Infographics in PowerPoint.” AWESOME — how long has it been since you’ve thought of Power Point as your BFF? Here are five infographic templates you can download to dazzle folks right now! Posted in Uncategorized | Comments Off on Infographics! Let’s Do This! Seattle Asian American Film Festival CALL FOR SUBMISSIONS! Less than a month left to enter your film for consideration for the 2014 Seattle Asian American Film Festival! Deadline is 9/15. Get that submission in soon! Seattle Asian American Film Festival CALL FOR SUBMISSIONS! Posted in Uncategorized | Comments Off on Seattle Asian American Film Festival CALL FOR SUBMISSIONS! Food. Tradition. Culture. Health. For American Indians, traditional diets of “First Foods” are being restored through food sovereignty programs. Simply, when people take control of their own food supplies, they gain better nutrition and food security. In the case of indigenous populations, they’re also reclaiming cultural practices that were disrupted by colonial interventions such as boarding schools and relocations. 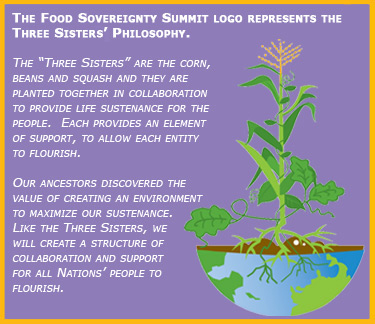 The Food Sovereignty Summit’s logo = Three Sisters philosophy. As always, one key to success is COMMUNICATION. So here’s my hope: If you, or somebody you know, have any words of wisdom about community outreach and food security, please email: nancyvanleuven@gmail.com. I’m part of next week’s Food Sovereignty Summit , a sustainability collaboration headed by the Oneida Nation. My goal: To create a toolbox of communication materials for any grassroots food group redefining their own local food systems. How can we better work together for access to fresh and healthy foods, branding and marketing local products, and collaborating to buy Indian/”stuff from HERE”. Have any suggestions? Want to partner? Admit it: We’ve been hearing the “CSR” death knoll for awhile now, that bleak march of an outdated effort. And, according to a bevy of global experts at today’s Global Washington conference, it’s being replaced by PERSONAL Social Responsibility to better recognize our individual and collective interest in human rights and values. I love this rebranding. (After all, corporations aren’t people, yeah?) We should be thinking of the actual faces attached to supply chains and such. Plus, increased corporate transparency is extinguishing smarmy greenwashing and other token efforts. Simply, the movement has expanded beyond slick reports to actual narratives, ranging from Northern consumers to the poorest of the poor who must survive beyond foreign aid. Free of the corporate framing, we can more easily get to the nitty-gritty discussions of socially-oriented cultural, social and environmental business impacts. Today, some of the best CSR insights came from a panel featuring Amir Dossal (Founder and Chairman of the Global Partnerships Forum), Raymond Offenheiser (President of Oxfam America), and my newest hero, Joe Whinney (Founder and CEO, Theo Chocolate). For a great example of the new corporate leadership in terms of individual social responsibility, check out Theo’s Eastern Congo Initiative for organic and fair trade chocolate and vanilla. It’s a daring business model for the private sector; that is, transparency and consumer engagement reigns supreme. And next time you hear about the latest CSR campaigns, smile just a little bit, because you’re already part of the cultural shift toward real change.